I thought much the same, for example LT's on the 207 and 427 and two doored buses on the 3 and 159. A lot of outer London bus routes still use conventional diesel buses which will not be allowed within the ULEZ that most LT routes cross into...unless TfL reduce requirements to allow diesels through if they are euro6 spec'd. There's also possible factors of some outer routes being unable to accommodate LTs due to street infrastructures. NOOOOO lol, don’t take the LTs away from me on the 3! I’d understand for fare evasion purposes, but I’d much rather have the LTs than even more MMCs in the area ! Besides, taking a ride on the 3 from Central London, the vast majority of people do pay, however as with any LT route, you definitely do get fare evaders.
. Not to say the MMC is a bad bus, it’s definitely got way more perks than the NRM in many ways. However when Abellio have taken over a large majority of your local routes, you get really bored of the lack of variety. I disagree, I have seen many times a DW on the 48 or 254 lose time especially through Stamford Hill area, where heavy on/off loadings slows it down, although not drastically. Its the same thing as the bendy bus. 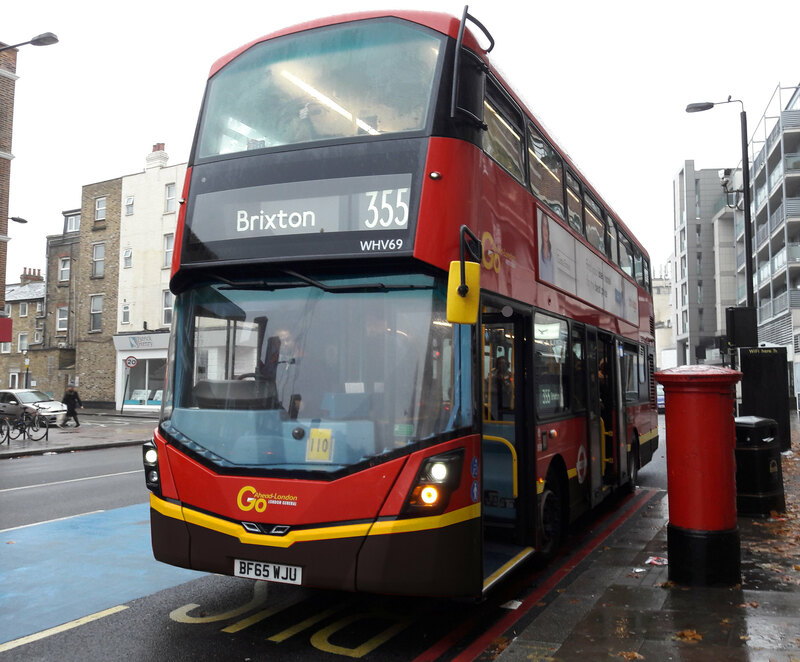 I was a fan of the boris bus but when the so called conductor didn't collect fares, but just supervised the platform, it then made it pointless. Wouldn't work I'm afraid. There are people who suffer no penalty if they don't touch in - Freedom Pass holders, Staff Pass holders, anyone holding a valid Travelcard. OK TfL may not get their stats and technically they're in breach of the Conditions of Carriage but no revenue inspector could legitimately levy a penalty fare nor institute a prosecution provided everything else about the pass / Travelcard was valid. It's also extremely difficult to make people counting readers work reliably and accurately in a crowded / congested environment with people moving in and out of the reader's area. DLR use overhead counting equipment at the entrances to all of their platforms but it can never be 100% accurate especially as people do walk in and out simultaneously. I'm going to be unpopular in saying this but if you have multi door boarding in order to reduce dwell times you will get an increased fraud risk. It's how it is. The alternative is the conventional OPO arrangement with its dwell times downsides offset to some extent by a lower fare evasion risk. It is perfectly legitimate to choose between those two basic options and to weigh the benefits and disbenefits appropriately. TfL has been happy to have a mix of boarding arrangements for a long while now - some driven by political decisions, some not. The other main point to make here is that TfL are much further ahead than other UK operators in eliminating or vastly reducing a lot of fraud. There is no overriding fraud with a flat fare, smartcards allow a far higher level of ticket and frand prevention check than printed paper tickets, drivers are given more info about rejected cards than they ever were in the pre-smart era, cash handling fraud has been eliminated, stolen and lost passes can be hotlisted and stopped. Concessionary travel schemes are more tightly controlled with photo ID based smart tickets. As ever I am not saying it is perfect, it isn't. There are gaps which some people try to exploit, there is the usual "pressure the driver" to be nice routine or the alternative "threaten the driver" routine to try to ride for free. This seems to be a favourite with some teenagers / those in their 20s. However, most commercial operators outside London remain strongly wedded to cash taken on bus despite all the costs from long dwell times and cash handling. Some are a bit braver with mobile app ticketing or smartcards but none are pushing very hard to get to where TfL is in terms of ticketing practice. I think they're terrified of going "too far" and inadvertently giving rivals a commercial advantage. This is evident in the appalling lack of good multi operator smart ticketing schemes which allow both season tickets and PAYG with daily / weekly capping. This despite a load of hoohah from the big groups about promoting multi modal tickets in PTE areas - most of it is a complete sham. The only small bright spot is the increasing use of contactless bank cards but this is still cash payment in return for a ticket. The current generation of buses are ultra boring anyway personally so the variety has already disappeared IMO and I'd welcome MMC's for both routes. Makes me wish the Volvo VHR/VHP type buses were the original NRM design which was rolled out, would have been a much more simple design and could have offered the bodywork on different chassis' which were available at the time. You'd have a more flexible bus with better seating capacity, CSAs wouldn't have been a worry and fare evasion wouldn't have been much of a problem either. Alternatively all these funds going towards the NRM could have even been invested in introducing tri-axle deckers from the get go when bendies were phased out. How TFL have only decided to consider tri-axle buses in 2018 while tour bus companies have been operating them safely for over a decade is just beggars belief. An E500 for example is 0.7m longer than an NRM but with significantly more seating and standing capacity. They could have been put to good use on many routes by now. The VHR/VHP is an improvement but I’d say ADL showed how you do it with the City - it took the MMC, added some styling cues from the LT and produced a pretty decent bus with the same capacity as a regular MMC. Definitely shows what happens when politicians don’t get involved. I could live without LT although they're still pretty to me, but if they didn't exist I'd accept more than happily ADL Enviro400H City editions circling around London because they're somewhat at least trying to look like LT or a bit more unique than a generic 400, and that's what I don't want, a London full of unique-less ADL 200/400 because at this point London slowly becoming just a capital of generic red buses unlike how it used to be...now people have to go to museums to see cool buses. I wouldn't say it's slowly becoming a capital of generic red buses. The truth is, it already is! I think before the NRMs were introduced, where all over adverts have become very common, you wouldn't really see a variety in exterior liveries . The only variety you may get from the generic red, prior to the NRM's introduction, were London red liveries that were only 80% red, for example Arriva, Go-Ahead, London United or Metroline's livery, or the very few buses that carried all over advert vinyls. Nowadays, like every London bus arrives in 100% red, everything definitely is very generic. Even with vehicle types. We only really see vehicles ordered from the 4 big manufacturers. 1. I'm considering all over advert vinyls as a different external livery, to an extent. And yet London has more fleet variety now than it had in LT days. Thousands of RTs, thousands of RMs, hundreds of RFs for years and years and years. 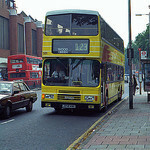 Even in later years it was thousands of DMSs, 1100 Titans, 1400 Metrobuses, 500 Leyland Nationals. There were some small sub fleets esp for Green Line but there was a *lot* of standardisation. And yes there some differences within the main classes but to the casual observer there were just loads of the same buses everywhere. It was only when compulsory route tendering came in when the government turned LT into LRT that you started to see a lot of variety as minibuses and second hand non London vehicles started entering the fleet. The changes to the route network (shortening trunk routes, new suburban services, area tendering schemes) also pushed fleet changes as did the move to low floor vehicles. We may be past the heyday of the late 80s to mid 90s in terms of variety but there's still a fair amount of variety these days. I have been hearing today about a TfL plan to make LTs/NBfL front entry only, with alighting at middle and rear. Routes would be converted one at a time with buses losing the oyster readers by the middle and rear doors overnight. Been told by a reliable source that the first route will be converted in June.